Maryknoll Boy Scout Troop #145 receives new colors from Casey Kasuyama of Commodore Perry Post of American Legion in Los Angeles, California, October 17, 1951. 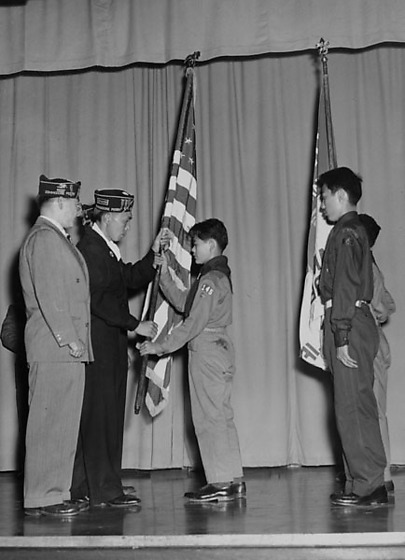 Three men stand at left wearing garrison caps, among them, Kasuyama presents an American flag to a boy in Boy Scout uniform in center. Two boys stand behind him at right holding another flag. Typed on original negative envelope: Maryknoll Boy Scout.